New CANable firmware is available for download! Download a fresh candlelight or slcan build and update your device. This batch of CANables was manufactured in the USA, and the design was updated with more robust USB connectors. These CANables have an overall higher fit and finish than previous batches. If you're interested in purchasing larger quantities (>20), send me a message at support@canable.io for pricing and lead time information. I currently don't offer international shipping on Tindie, but I do offer it on - Protofusion Labs Store. 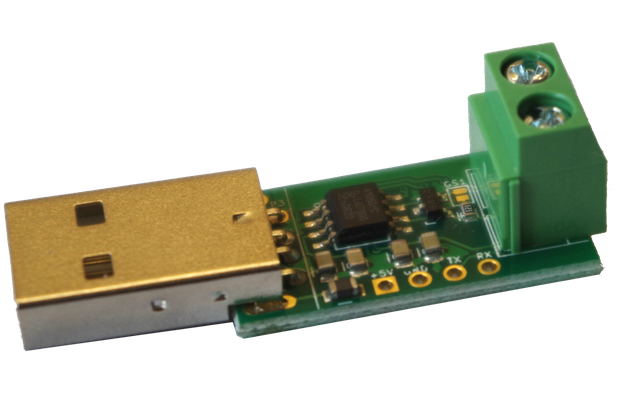 The CANable is a small open-source USB to CAN adapter. The CANable shows up as a virtual serial port on your computer and acts as a serial-line to CAN interface. On Linux the CANable works natively with slcand, so you can use all of the standard can-utils command-line utilities and even Wireshark to interact with the bus. Using the alternative candlelight firmware, the CANable enumerates as a native socketcan device with no need for slcan. On Windows and Mac, the CANable works with cantact-app. This is a simple Java application that shows CAN traffic in real-time and allows you to transmit messages on the bus. For even more flexibility, the canard library allows you to directly talk to the CAN bus from Python. The library is cross-platform and can connect directly to a CANable's virtual serial port interface. With only a couple lines of code you can decode traffic on the bus, send messages, and more. Check out the getting started page for more information on getting a CANable up and running. 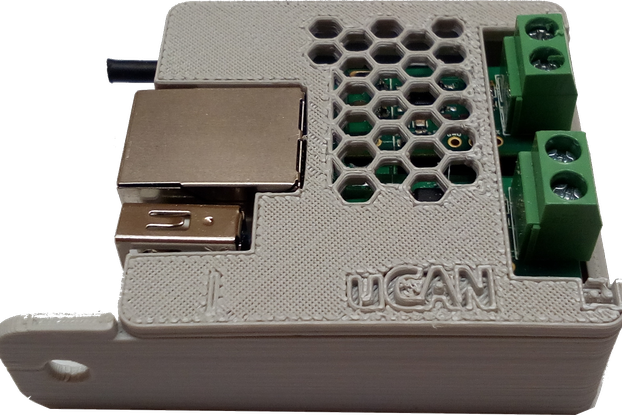 The CANable is a hardware clone of Eric Evenchick's CANtact project in a smaller form factor. Eric also developed cantact-app, canard, and most of the other awesome tools that work with the CANable and CANtact devices. 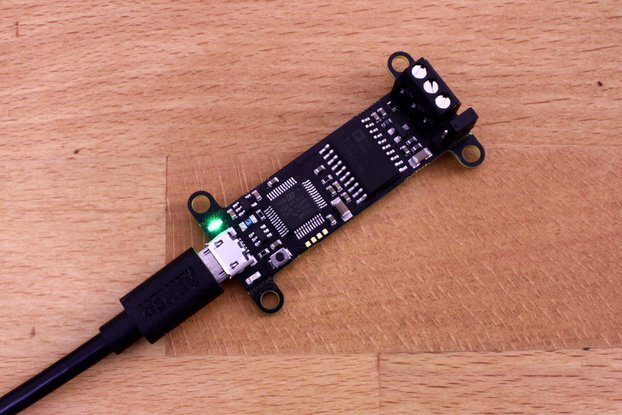 The CANable is a low-cost open-source hardware tool. While I have full confidence that the CANable will meet your needs, please do not use the CANable in any mission-critical or life-threatening situations. I claim no responsibility for unacceptable use or damages. However, if you encounter a hardware or software issue with CANable, please let me know and I will do my best to resolve the problem as soon as I can! HARDWARE: The fit and finish for the assembled board is quite excellent. The silkscreen is reserved for labels that the user needs to know (pinouts, the function of LEDs, etc.) and doesn't show the part designators, which is kind of a nice touch. The solder joints all look textbook (correct amount of solder, good reflow settings, etc.). The micro USB connector also wisely has two tabs that go into the board for mechanical strength and looks like it will be fairly robust. SOFTWARE/FIRMWARE: 1) Documented API/drivers for Windows, 2) Windows compatible Python library, 3) support for Busmaster. These would really push this up to be my hands-down go-to CAN-USB adapter. I'm fine with running linux in a VM for myself, but I have a need for a CAN-USB adapter that customers can use to configure devices themselves with a GUI and update device firmware via a CAN bootloader without having to use linux or spend hundreds of dollars on a CAN adapter. HARDWARE: The only hardware suggestions I have is 1) to include labels for the jumper pins on the bottom side of the board as well as the top that includes some sort of boxing to indicate which jumper position does what (this understandably may be difficult to do given the small size of the board), and 2) mounting hole features like the isolated version has would be nice to have, although it's understandable that they're not included to maximize the number you can get out of the panel. That pretty much says it. Its a nice design and works great. The product's website has all the info I needed to get up and running fast. Take around 1 day to learn to use,was used for diagnose an automotive set of switches with excellent results,running smothly without issues into raspberry,python tools are amazing working with this gadget,size of pcb is tiny and very handable,i recommend as a bench and design tools for every project using CAN and UDS Protocol. Great when used with the candlelight fw on linux! I have 3 of these and it works amazingly but only when I reflashed them with the candlelight fw. Using slcan the performance is questionable at best under Linux and the device would frequently stop working. The hardware is rock solid. I actually ordered 10 for my team and they are in use daily! I have a bunch of other CAN interfaces and all of them are (much) more expensive than the CANable. I usually use a Kvaser Leaf Light HS but it requires a special driver that's a pain to install on a Pi3. I ordered some of the CANables not expecting much but I'm impressed so far. I especially like the CANtact library for direct Python usage without messing with drivers or the SocketCAN interface. One has to be careful wiring this thing to the car. Canable has 4 terminals: canh, canl, ground, +5v. Only canh and canl need to be wired to the OBD2 connector if that's what you are doing. I initially connected canable ground to obd2 signal/chassis ground and that really made me and my car freak out. It somehow recovered after throwing a couple of error codes. I have prior experience using Kvaser and Vector hardware to interface with CAN. Unfortunately I am not in a postion to purchase one of these devices for myself. The CANable has worked well to log CAN traffic on my car, and will talk to a CAN arduino shield that I have connected it with. The CANable itself is very simple to use, any issues that I have had so far are entirely due to my lack of experience with SocketCAN. 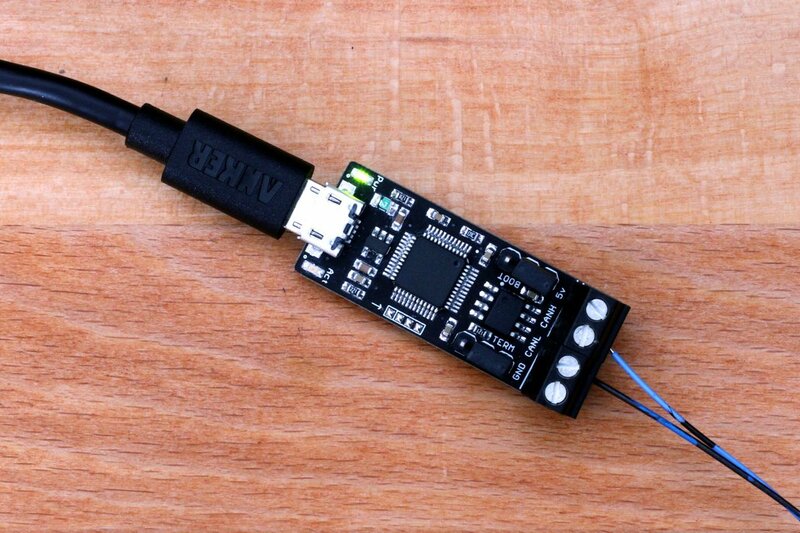 A cheap arduino clone with a minimalist CAN shield will run about the same price as this, but I feel that the CANable is still a better option. Regarding price, size and usability the CANable is the best USB to CAN Adapter I've seen. 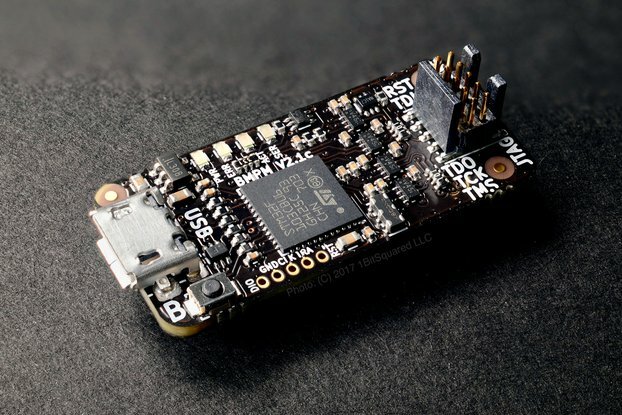 The tiny PCB has all connections it needs, and firmware-wise we moved away from the original slcan to an gs_usb driver (https://github.com/nexulm/candleLight_fw), which has the advantage that the bus parameters can also be changed after first initialization (in opposite to slcan) through the normal socketcan api. So since a few days the device is now in testing, and up to now is works as it should without any problems. So I can recommend the CANable to everybody who easily wants to connect his socketcan environment via USB to any can bus around. Thanks for the review Steffen! I just tried out the candleLight firmware on some CANables, and it works great. Having direct kernel support without SocketCAN is awesome. I'll add the candleLight firmware to our documentation soon! We developed LabVIEW programs to talk to the CANable board over the VirtualCommPort at 115.2k and it works great. The blue status light blinks every time a CAN message comes in. This thing is compact and fast! I evaluated one of these for use in an industrial control related application. The specific use is for temporary connectivity for testing and setup. Due to this special environment I wrote our own driver interface directly using the text string command set. It worked flawlessly when connected to a known good CAN bus. That was the only issue, "when connected to a known good CAN bus". During test and setup the CAN bus may be down. To solve this problem I have pushed out a firmware update having an added command to get the CAN port bus state so I may discover soon enough that the bus may be down and so force restart CANable. Problem solved. I have sent this update back, Ethan plans to test and incorporate it. I have the update posted on my website, www.electronics-software.com, available for download as well. I also have created some detail documentation of the text string command set and reply content, included in my update. The company I am doing this for plans to deploy in the field service area. I used 4 of these in a USB hub to record data from my car's 4 CAN buses simultaneously. It works perfectly (it basically shows up as a USB serial port, and then the SLCAN encapsulation on top of that - you can use canutils or just read the ASCII serial output directly depending on what you want to do), and I was able to capture all the data with no dropped packets.